In 2016, the National Park Service, the National Capital Planning Commission, and the Van Alen Institute launched “Memorials for the Future,” an open call that asked designers, artists, and social scientists to “reimagine how we think about, feel, and experience memorials.” The winning entry, Climate Chronograph, by California-based landscape architecture studio Azimuth Landcraft, took on climate change as its prompt. 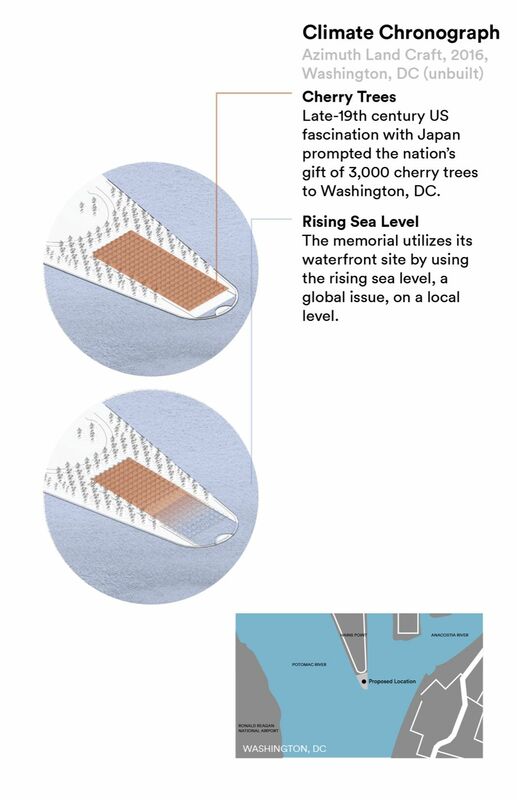 Capitalizing on the cultural and civic value of the District of Columbia’s cherry trees, Azimuth proposed the reshaping of Hains Point, a sliver of land at the meeting point of the Potomac and Anacostia Rivers where tourists travel to view cherry blossoms each spring. Noting Hains Point’s low elevation, Jensen and Sunter proposed planting rows of cherry trees on a slope leading down to the river. As sea levels rise, rows of trees die one at a time, creating a visual record of the damage of climate change. Fast forward a century and a half and the slope is gone, and black branches are poking out of the water. The proposal also used the location of the “Memorials for the Future” to its advantage; by placing the memorial at the doorstep of the Capitol, the pair targeted the policymakers whose decisions have a global impact. Climate Chronograph heralds a dark future, which is also deeply grounded in the past. Azimuth co-opts Washington’s cherry trees, the symbolic gift from Japan to the United States that arose out of late 19th century American fascination with the pink blooms. The gift symbolized diplomatic friendship and continued to represent United States–Japanese relations as time progressed. Now an annual celebration, the National Cherry Blossom Festival brings over a million visitors each spring to the District to watch performances and photograph the flowers. As the blossoms have long served to represent a world in diplomatic harmony, Azimuth’s flooding structure now mobilizes these very same trees to illustrate the stakes of a global threat such as climate change. The site offers the trees as an analog for the sort of networks that will buckle under a heated planet, the loss that we can already foresee. Of course, unlike the tides of less curated environments, the water in Climate Chronograph is designed to rise aesthetically, evenly, and predictably. In this site, the harmful effects of climate change are portrayed as being felt equivalently across many contexts. Yet as the Azimuth structure fails to recognize, global exchange is hardly ever equal. Exchanges made across borders are seldom innocent. Gifts—memorials included—are wrapped up in calculated diplomatic strategy, in expectation of future cooperation, and in the desire to put a soft marble face on complex global problems. When American Commodore Matthew Perry sailed into Tokyo Bay in 1853, he brought guns, liquor, a telegraph machine and a camera, among other Western products. In return, however, he negotiated treaties that restricted Japan’s economy for decades into the future. 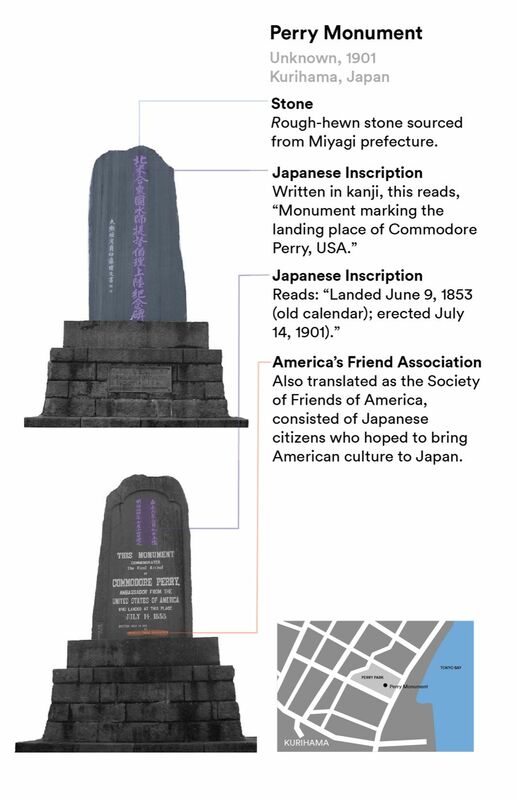 While memorials to this voyage, placed everywhere from Newport to the shores of Tokyo Bay, may look heroic at face value, their supersized scales obscure the global inequalities that Perry’s mission helped to produce. In few places is this global inequality of memory more present than in the extant public memorials dedicated to the dropping of atomic bombs on Hiroshima and Nagasaki. The Hiroshima Peace Memorial Park sits in the center of the city, on a peninsula formed by the confluence of two rivers. In one long, graceful, axial plan, its memorial museum lines up with a cenotaph—a monument for those whose remains are buried elsewhere—and the restored Genbaku Dome, a ghostly relic of the lone building that remained standing after the atomic blast. Surrounding this central axis sit a children’s memorial, a library, an auditorium, a conference space, and dozens of smaller monuments added in the years since the original construction. The entire park is landscaped, with a mix of footpaths and plazas. The Peace Park has become a meeting point for annual remembrance, reflection, and anti-nuclear protest. Unlike Azimuth’s Climate Chronograph, loss here requires neither simulation nor prediction. Rather, it comes as an object to live alongside, to live with—something that has always already happened. Markers of the devastation persist, in the skeletal structure of the Genbaku Dome and in the memory of loss kept alive by the continuous return of mourners to the site. The United Nations Educational Scientific and Cultural Organization (UNESCO) added the Genbaku Dome, known as the Hiroshima Peace Memorial, to its World Heritage List in 1996. Underscoring its importance to not only Japan but to the global public, the 1996 Advisory Body Evaluation described the site as a “universal monument for all mankind, symbolizing the hope for perpetual peace and the ultimate elimination of all nuclear weapons on earth.” This designation reiterates the importance of peace after atomic warfare, and Japan’s role in this advocacy work. While the Peace Park serves as a highly visible architectural reminder of atomic warfare, the United States bears no physical monument that fully reconciles its role in the devastation. Rather, its atomic past is hidden away in heavily guarded facilities and on isolated islands, out of view from the American public. Simonian proposed to place this deposit on the National Mall, surrounded by the federal agencies, NGOs, and lobbyists of transnational energy corporations to act as a warning for those most responsible for the future of nuclear policy. 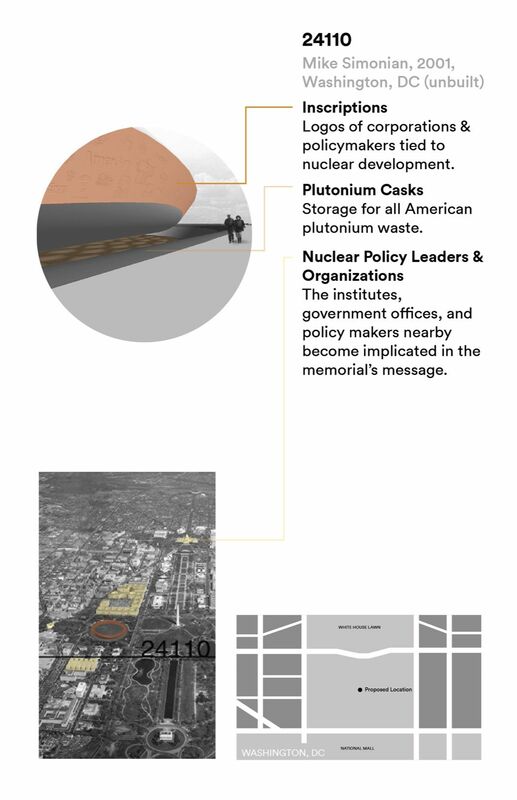 The memorial would consist of a large disc surrounded by a ring of 241 steel clock totems, gradually inserted into the ground around the memorial once every century to signify the gradual passing of the plutonium’s half life. This context precludes the memorial from ever being built—no federal construction project has ever been built with an intended life of 24,000 years. While this use of discursive design allows Simonian’s proposal a degree of gravity that would be impossible were physical construction a necessity, the memorial’s solely theoretical state enables the gradual forgetting of its message over time. The written plans may be distributed globally, but the absence of a material instantiation forgoes a key feature of the monument—its ability to gather those around it, to foster community and catalyze political response. 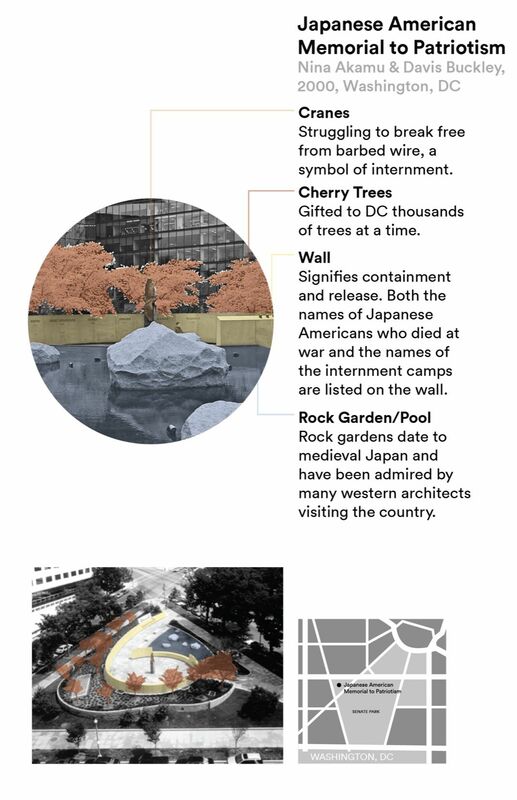 On a more feasible scale, the National Japanese American Memorial to Patriotism, constructed in 2000—after years of advocacy by Japanese-American community organizations—is the closest example of a national memorial that admits American abuses during World War II. The project sits on a formerly unused, triangular plot not far from the National Mall and consists of a plaza designed by architect Davis Buckley and a bronze sculpture created by sculptor Nina Akamu, whose grandather was interned in the '40s. The memorial recognizes the thousands of Japanese-Americans who were incarcerated in camps throughout the western United States for much of World War II, and highlights those who still served in the military while their families and communities were jailed in the desert. However, in foregrounding patriotism, the memorial garnered harsh critique for its lack of attention to acts of resistance by Japanese-Americans during wartime. Encircling the shaded plaza, a spiraling granite wall bears the name of the ten incarceration camps in solemn, blocky characters. Akamu’s crane is emotive and well-rendered, but nowhere are the names of the over 100,000 people held against their will. No mention is made to Fred Korematsu, who brought internment all the way to the Supreme Court. Nowhere are the “No-No” boys, the few hundred Japanese-Americans who answered “no” when asked if they would swear allegiance to the United States and serve in the war effort, often at great personal expense. By the time the memorial opened in mid-summer 2001, the cherry trees that encircle its central plaza had long dropped their blossoms. Instead, their bright green boughs served as a backdrop to speeches by Senator Daniel Inouye, Transportation Secretary Norman Mineta, Representative Robert Matsui, and a taiko performance, which opened the memorial with gracious calls to unity. Despite its intended message, the forty-minute ceremony, recorded by C-Span for posterity, feels inadequate—a too-perfect stamp of closure on a legacy of active resistance, community organizing, and governmental hesitance to admit wrongdoing that doesn’t fit neatly between orderly stone walls and cherry trees. And as the trees begin to lose their flowers in mid-April, maintenance workers will sweep away their petals to ensure that the narrative this space conveys remains spotless. Jeremy Lee Wolin B/RISD’19 still loves the DC metro.